For the fourth installment of the Soundscapes Concert Series, vidnaObmana will perform a concert at the City of Bethlehem's IceHouse on Sand Island. Located in historic Bethlehem on the north bank of the Lehigh River, the IceHouse is a perfect venue for a concert of spacemusic. This concert will be on Saturday, April 19, 2003, starting at 8:00 pm. The doors will open at 7:30 pm and Chef Jeff will cater a free buffet dinner. Tickets are $17 in advance and $20 at the door. Advance ticket availability is on-line at http://electro-music.com at coming soon to local outlets. NOTE: There are no discounts on advance tickets. Tickets at the door will be discounted by $3 for those who show their WDIY or WMUH membership cards or their full-time student ID. Ticket holders get a special deal on the purchase of the next Soundscapes Concert with Robert Rich. See below for setails. Ambient musician vidnaObmana is one of spacemusic's brightest stars. Using synthesizers, audio processors, and a vast array of exotic instruments, Belgian electronic musician vidnaObmana creates a complex, layered musical journey through rhythms, timbres, loops, and sonic atmospheres. The name vidnaObmana means "optical illusion" in Serbo-Croation, a term he picked up while vacationing in Croatia during his childhood. He chose this phrase as his musical persona to illustrate how his music correlates sonically with the surreal soundscapes he creates. vidnaObmana is a prolific composer whose diverse body of work ranges from post-industrial through gently atmospheric, to tribal ambient and more. His music slowly shifts through electronic audio imagery, creating extremely personal works of atmospheric delight. 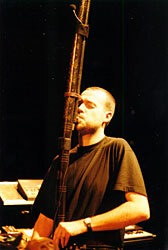 Throughout his career, vidnaObmana has explored the abrasive side of electronic composition, using freeform soundscapes, international music traditions, and post-classical experimentations. His music has been released widely by many independent labels worldwide, including: Release/Relapse, Amplexus, Extreme, Hypnos, Mirage, Multimood, Projekt and others. A significant portion of vidnaObmana's work has been realized in collaboration with some of the world's most interesting musicians such as Alio Die, Jeff Pearce, Steve Roach, Djen Ajakan Shean, Asmus Tietchens, and Brannan Lane. Robert Rich comes to the Soundscapes Concert Series on July 12 after he returns from France. Tickets will be $20 at the door, $17 in advance, and $15 at the April 19th Soundscapes for vidnaObmana ticket holders only.